First, an extra extra for you—hang on, is that right amount of extras? OK, yeah, it is. Rosemarie and I are very happy to be the guests on the new episode of Noir Talk, the podcast dedicated to the Film Noir Foundation’s efforts and hosted by Haggai Elitzur. 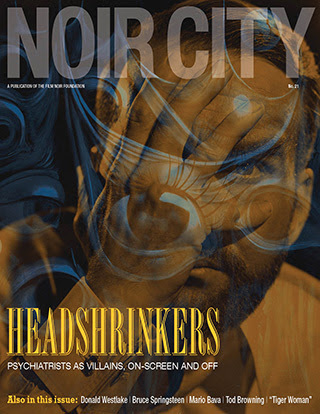 We talk about the Noir City film festivals, how issues of the magazine are assembled, and the Foundation’s role in inspiring the work of our mystery fiction-writing alter ego Renee Patrick. Tune in here. A survey of Donald E. Westlake films by Ben Terrall, perfectly paired with novelist Danny Gardner’s appreciation of his favorite neo-noir, the Westlake-as-Richard-Stark-based The Outfit. Plus we welcome back Noir City Sentinel scribe Eric Beetner with his new column The Dark Page. 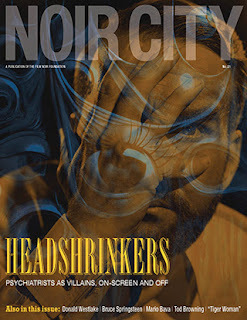 This look at noir fiction kicks off with an interview with the one and only Bill Crider. We also add whip-smart film writer Nathalie Atkinson to our roster of critics. And like all good meals there’s a sweet treat at the end in the form of a new book review from our ol’ pal Ray Banks. Yes, I’m in it, too, with my usual Cocktails & Crime column. I also get in on the Westlake lovefest by recounting a favorite production story in our On The Set feature, spotlighting Point Blank. How, you may ask, do I acquire such treasures for my own edification? Simply make a contribution to the Film Noir Foundation and all this, and more, can be yours!